Whether you’re an agency, studio, professional web designer, or someone who just wants to create their first website, finding the right software for the job is critical. For professionals, popular online website building tools such as Squarespace can quickly become restrictive due to their limited functionality. On the other hand, first­ time web creators are likely to be suffocated by the abundance of options available in high­-end website building tools. Before choosing a software package to help build a website, it’s important to understand the different types that are available. Let’s start this journey with a brief introduction to website builders. In case you’re unsure what website builders are all about, I’ll give you a brief tour. Traditionally, if you wanted a business website created you would’ve needed to turn to a professional website development company. For a basic site consisting of a few pages, you may have had to pay about $1,000. (Source: How Much Does a Website Cost in 2014?) On top of these set up costs, you’d also need to pay for any updates/changes to your site. In other words – having a website created and maintained was far from cheap. However, the exorbitant costs created a gap in the market for low­-price, easy-­to­-use website builder tools, that even a first­-timer could use. For about 1% of the cost of a professionally­ created site, you could build your own. You could also add new content and make changes at any time – and at no extra cost. Popular website builder software includes: Weebly and Wix. All two companies offer a free version of their software (with limited functionality). How powerful these tools may be, they lack functionalities for professional use. One of the main obstacles is that content and design are not separated, which could impact brand consistency in the long run. Besides website builders, another popular tool for creating sites is something called CMS. Let’s take a look at that now. I’ve Heard of CMS – but What Is It? CMS stands for Content Management System. Typically, it’s a piece of software that allows you to create and manage content such as articles, blogs, reports, images and videos. You may have heard of some of the more popular CMS tools: Drupal, Joomla and WordPress. These advanced CMS tools allow websites to be created and published by a user (or users). Due to the high­level of customization available within common CMS tools, they are most likely to be used by tech-savvy individuals web developers. Graphic design studios want to focus on the creative aspect of the project, customising templates by editing CSS in themes is just not flexible enough. If you’re unsure whether to go down the route of website builder or CMS, fortunately, there is another option for you to consider. SiteManager positions as an all-in-one cloud web design studio, because it offers integrated applications for both graphic designers, front-end developers, content and project managers. Website builders and CMS are both good solutions for creating websites, but they each have their limitations too. Namely, most website builders lack advanced functionality, and CMS tools can be complicated to learn and use. Fortunately, there are web design platforms that offers the best of both worlds. Encompassing the simple functionality of website builders (e.g., drag­-and­-drop design editing) and the sophisticated features of CMS tools (e.g., powerful developer tools), is a platform called SiteManager. SiteManager positions as an all in one web design studio in the cloud, as it offers integrated applications for both graphic designers, front-end developers, content and project managers. Zero installation time – no need to spend hours setting up your site. Responsiveness without coding – your site should be fast with resorting to custom coding. Website templates – like many of its competitors, SiteManager offers you some tasty templates to choose from. But of course you also could start from scratch if you want! Cloud­ hosting – separate hosting can be burdensome, SiteManager can arrange this for you. Automatic updates – you can say goodbye to having to manually update the back end of your site. Custom integrations – external APIs can be integrated using AngularJS. Automatically generated sitemap – search engines use sitemaps to determine the content you have on your site, and have often it’s updated. The SiteManager tool creates your sitemap automatically. From my research, it appears that SiteManager has a unique market position – attracting both first­-time website creators and web professionals. This inclusivity is also reflected in the pricing, which extends from an affordable €2 per year for the starter package, through to €155 per month for the top-­of-­the­-range agency package. CMS app – straightforward content management system for you and your clients. Dashboard app – to create and manage your website projects. Design app – responsive content and layouts can be created within your browser. Developer app – a back end builder giving you the freedom to code anything you can imagine. Maintenance and updates – daily updates and improvements to their cloud platform. Premium support – dedicated customer support team to help and advise you. Beyond website creation, SiteManager also offers a web hosting facility (from €10 per month). This means that you could keep your entire web development and hosting requirements within this one tool. By doing this, you’re likely to make your life easier – as well as potentially saving you money. Could this be the one for you? 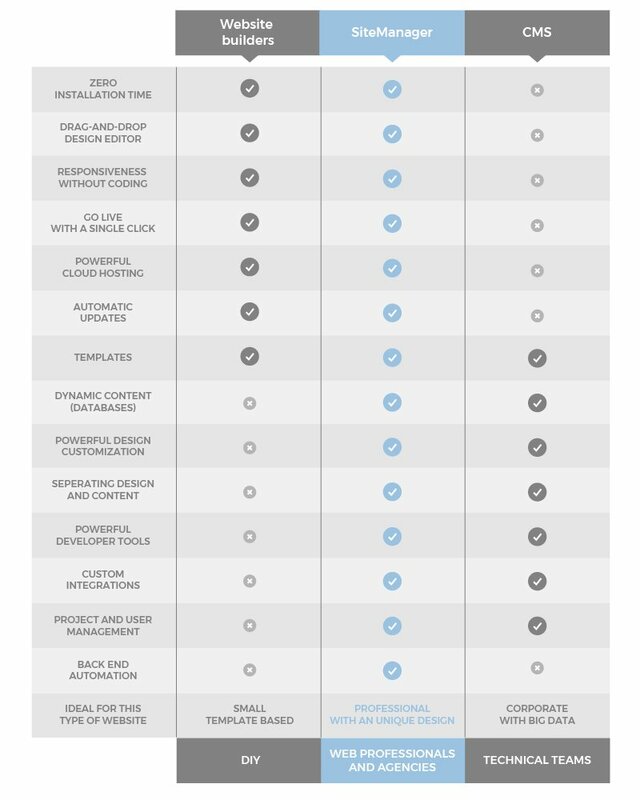 While there may be a website builder or CMS that meets your needs, as the graphic below shows, SiteManager stands above the competition due to its practical combination of CMS and website building features. SiteManager offers you as many (or as little) functions as you need to get the job done. If you want to set up a basic site, you can do this quickly and easily. If you want something more complex, SiteManager will go with you all the way. Like most of the website creation tools I’ve mentioned, SiteManager can be tested out for free. I suggest that you give it a whirl.